The Internet is abuzz with the news (??) that Donald Trump endorsed Mitt Romney for the Republican presidential primaries. (BTW- Trump’s “The Celebrity Apprentice” returns on Sunday, February 12, only nine days away. Surely this is just a coincidence, yes?) According to the mainstream nightly news summaries that I could not avoid for the life of me, the formal announcement came with great fanfare. Trump, quite the master at promoting (TRUMPeting?) himself and his television show “Celebrity Apprentice” put on quite a show with the formal announcement. They even had a two-minute warning so news outlets could carry the announcement live! OccupyBawlStreet.com has a well-placed source, code name “SHALLOW ESOPHAGUS”, who reports that the Republican hopefuls that had apparently come to kiss Trump’s ring these past months, were in fact auditioning for the 2013 season of Celebrity Apprentice. Trump and his TRUMPeters determined that Mr. Romney was the greatest potential draw for the show. SHALLOW ESOPHAGUS also reports that venture capitalist Romney, always hedging his bets, has agreed to appear on Celebrity Apprentice only if he does not secure gainful employment in the White House. So, does Trump’s accepting Romney for “Celebrity Apprentice” hurt or help Romney’s presidential aspirations? A Wall Street Journal/NBC News poll in April of 2011 among likely Republican primary voters found that Mr. Trump had a 96% name recognition. As to who they would actually vote for the poll found 21% supporting Mr. Romney in 1st place in a nine candidate field. Mr. Trump was tied with former Arkansas Gov. Mike Huckabee at second place with 17%. More informative however is a poll published last month by the Pew Research Center for the People and the Press and the Washington Post. It found that “An endorsement by Donald Trump would draw a mixed reaction among Republican and Republican-leaning voters: 20% say they would be less likely to support a candidate backed by Trump, 13% more likely and 64% say it would make no difference.” Our conclusion? You will see Romney on the 2013 season of celebrity apprentice. 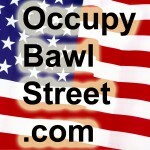 Thankfully, OccupyBawlStreet.com will not see that because we’ve never watched the show and have no interest in starting now. So, what do YOU think? Post a comment or share this article if you deem it worthy. Thanks for stopping by! This entry was posted in Humor-Parody and tagged endorsement, donald trump, mitt romney, trump, romney, mitt, primary, polls, celebrity, apprentice, celebrity apprentice, SHALLOW ESOPHAGUS, donald trump apprentice 2013 by obs. Bookmark the permalink. Not a Trump fan at all, so his endorsement has no bearing on my vote at all. This was kinda a shocker for me, as ole Trumpy boy did not have such kind words to say about Mitty just a few months ago……If I was running for prez, my slogan would be….. “any one but the O in 12″… Our only hope is NEWT !!! !